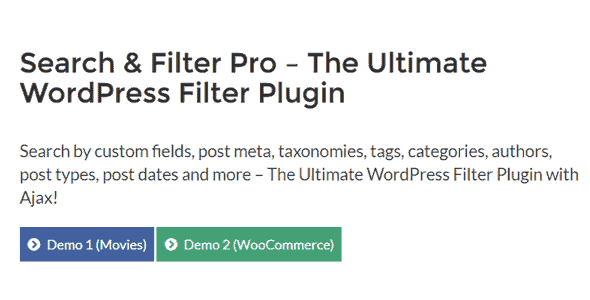 Search by custom fields, post meta, taxonomies, tags, categories, authors, post types, post dates and more – The Ultimate WordPress Filter Plugin with Ajax! It allows you to Search & Filter your posts / custom posts / products by any number of parameters allowing your users to easily find what they are looking for on your site, whether it be a blog post, a product in an online shop and more. Users can filter by Categories, Tags, Taxonomies, Custom Fields, Post Meta, Post Dates, Post Types and Authors, or any combination of these easily. Use for blogs, reviews sites, news sites, property sites and more. Great for searching in your online shop, tested with: WooCommerce (+product attributes), WP eCommerce and Easy Digital Downloads. Screenshots of Search & Filter admin section and when used in different themes (2013 and WooCommerce) – click to open full size images. Auto Count / Dynamic Count – dynamically update the count values in the search forms as a user is searching to reflect the correct number of terms for the current search. Meta Data: this can include by popularity, price, or anything else you use your meta fields for as numerically or you can sort your meta data alphabetically. Choose whether sorting is ASC or DESC – both are optional. Frontend UI elements – jQuery date picker, range sliders and comboboxes from Chosen. Use custom templates for your search results. Works with Advanced Custom Fields (ACF) plugin – allows you to search with dropdowns, checkboxes, radio buttons and multiselect even where the meta value is serialized. Essentially, if you are using any of the Basic fields (not text area) or Choice fields then you can filter these in Search & Filter Pro. Date Picker is now also supported provided the date is stored as “yymmdd” as the save option with ACF.